What made a failed Austrian artist into the most reviled and destructive personality of the twentieth century? Where did the seeds of his rabid anti-Semitism lie? How did a marginalized loner become such a moving force in Germany? How could a nation have fallen for such a fanatic? What made him so determined to bring about war? Through manipulation of politicians and civilians, bullying, diplomacy, violence and lies, Hitler achieved a total and unlikely power. 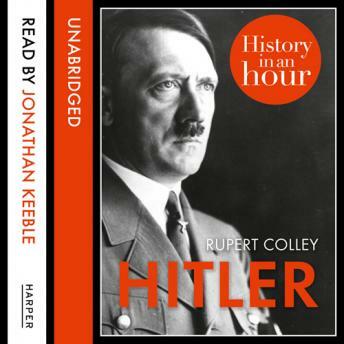 Covering his early life, military service in World War One and eventual rise to power, first as the leader of the Nazi party, and then head of state, Hitler: History in an Hour describes the life of a man who spent his final days inside a bunker having plunged the world into a global conflict, the bloodiest in history.